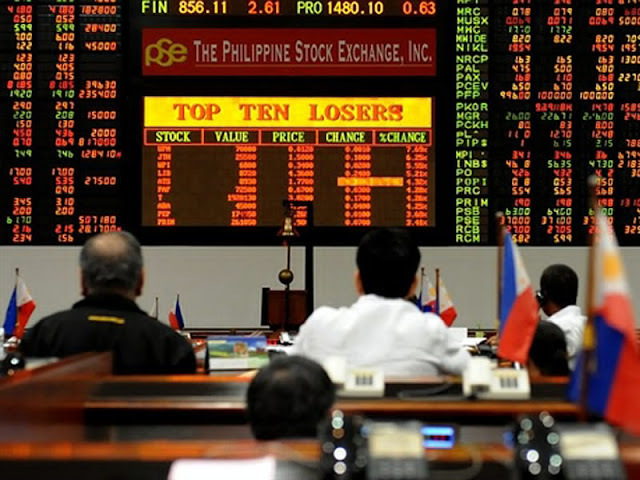 MANILA -- The Philippine Stock Exchange index (PSEi) managed to improve Thursday amid investors’ concern over Brexit uncertainties and other global trade issues, but the peso did not fare as well against the greenback. A day after closing on the red, the PSEi improved by 0.19 percent, or 15.35 points, to 7,876.40 points, which a trader said bucked the downward pull generated by external developments. These developments include the developments in Turkey after its government decided to freeze liquidity, which players fear might affect other emerging countries. The improvement in the main stocks gauge was followed by the All Shares after it rose 0.16 percent, or 7.54 points, to 4,843.44 points. It was a mix among the sectors although most ended with gains and these were led by the Industrial at 0.61 percent and was followed by the Financials, 0.42 percent; Property, 0.32 percent; and Holding Firms, 0.02 percent. On the other hand, Mining and Oil contracted by 1.52 percent and Services, 0.55 percent. Volume reached 900.6 million shares amounting to PHP5.1 billion. Gainers led losers at 120 to 78 while 46 were unchanged. On the other hand, the peso finished the day at 52.75 from 52.61 a day ago. It opened the day at depreciated level at 52.71 from the previous session’s 52.6. It traded between 52.85 and 52.7, resulting to an average of 52.782. Volume reached USD929.72 million, higher than the USD704.2 million.